Tonight’s game in Philadelphia had to be postponed due to a coastal winter storm that is forecasted to bring blizzard conditions to the area. It is the first Tuesday game since Oct. 1, 1946, according to the Elias Sports Bureau, when the Giants played the now-defunct Boston Yanks. Oddly, this game was originally scheduled to kick off at 1 p.m., when conditions were not bad for Philadelphia, but the game had already been moved to primetime under the flexible scheduling provision for Sunday Night Football. By 8:00, the conditions are expected to be far too dangerous for the public. Philadelphia hosted the 1948 NFL Championship game at Shibe Park between the Eagles and the Chicago Cardinals in a heavy snowstorm. 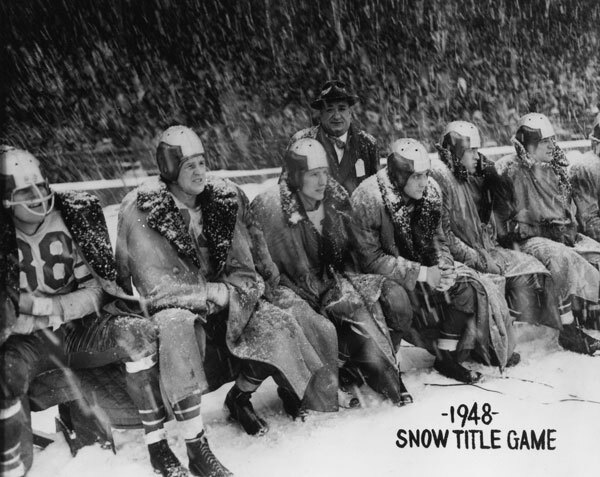 Despite the league office considering a postponement, commissioner Bert Bell allowed the game to be played (video from E-footage.com). The decision to postpone the 2010 game is the right one from a public-safety standpoint. As incredibly awesome as the sight might have been of a heavy snowstorm, it is not worth jeopardizing the safety of the fans, game personnel and emergency services. In the end, it is just a football game. Article 4. The NFL affirms the position that in most circumstances all regular-season and postseason games should be played to their conclusion. If, in the opinion of appropriate League authorities, it is impossible to begin or continue a game due to an emergency, or a game is deemed to be imminently threatened by any such emergency (e.g., severely inclement weather, lightning, flooding, power failure), the following procedures (Articles 5 through 11) will serve as guidelines for the Commissioner and/or his duly appointed representatives. The Commissioner has the authority to review the circumstances of each emergency and to adjust the following procedures in whatever manner he deems appropriate. If, in the Commissioner’s opinion, it is reasonable to project that the resumption of an interrupted game would not change its ultimate result or adversely affect any other inter-team competitive issue, he is empowered to terminate the game. Article 5. The League employees vested with the authority to define emergencies under these procedures are the Commissioner, designated representatives from his League office staff, and the game Referee. In those instances where neither the Commissioner nor his designated representative is in attendance at a game, the Referee will have sole authority; provided, however, that if a Referee delays the beginning of or interrupts a game for a significant period of time due to an emergency, he must make every effort to contact the Commissioner or the Commissioner’s designated representative for consultation. In all cases of significant delay, the League authorities will consult with the management of the participating clubs and will attempt to obtain appropriate information from outside sources, if applicable (e.g., weather bureau, police). Article 6. If, because of an emergency, a regular-season or postseason game is not started at its scheduled time and cannot be played at any later time that same day, the game nevertheless must be played on a subsequent date to be determined by the Commissioner.